Band buys Casio in attempt to shake unshakeable comparison. Fails. Film at 11. Know this: you will never read an article, review, or interview involving the Birmingham, England band Editors that doesn't include the words "Joy Division". You might not even squeak by without reading a thing or two about Interpol (the other band who can't be mentioned without invoking the J-word). Anyone who listens to rock today knows that Joy Division's influence is so powerful and vast that it has actually become tiresome and annoying. And Editors vocalist Tom Smith, along with Interpol's Paul Banks, knew the job was dangerous when he took it, being the leader of the pack for this new generation of singers for whom it appears mandatory to pass an Ian Curtis Proficiency Exam. When their records stop selling, they can go into business for themselves teaching a prep class at the Learning Annex. But perhaps Editors have become tired and annoyed too, and are ready to stop hearing about how much they sound like the band that clearly inspired them. Their third CD,In This Light and on This Evening, is a noticeable departure from the formula they perfected on their critical smash of a debut, The Back Room (2005), and the follow-up An End Has a Start (2007). The tight, angular confessionals of their debut gave way to more expansive, arena-ready sounds that drew different comparisons, this time to acts like U2 and Coldplay. On In This Light, the electronica has come to the forefront. Editors have already allowed us to brood in our bedrooms, and rock out with our lighters aloft. Now they want us to dance. 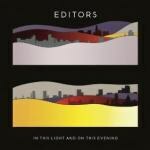 From the opening strains of the title track, the Editors' signature sound is recognizable, but there are a lot more bleeps and bloops and clicks and clacks, as if Georgio Moroder got a hold of it. "Bricks and Mortar" also takes the Casio and runs with it, but ensures the lyrical content is going to be as dour as you've come to expect from our bummed-out Brummies ("No one understands the way you found your God / There's a bullet in your hands"). The penultimate cut, "Eat Raw Meat = Blood Drool", is just about as "WTF?!" as the title suggests, and will not ever grace this reviewer's stereo again without a mad dash for the skip button. "Papillon", the first single, stuck in my head for days because it reminded me of something I couldn't place. Then I realized it was Floodland-era Sisters of Mercy. How's that for escaping the Joy Division ghettoization? Tom Smith uses upper registers of his voice that most people probably didn't know he could access, even employing falsetto on tracks like "The Big Exit" and "Walk the Fleet Road". That should shake the Ian Curtis comparisons, right? And that appears to be the goal of In This Light and on This Evening: a band distancing itself from its influences seemingly just for the sake of it. Unfortunately, it is to the detriment of the music. While the effort to avoid simply regurgitating their first two releases is admirable, I found myself missing the soaring quality of a song like "An End Has a Start" or "Bullets". In This Light and on This Evening dials it down so far that it doesn't contain one track that comes close to the power of songs they seemed to toss off so effortlessly before, like "Munich", "The Racing Rats", or "Bones". Those are songs that left me shaken like a rag doll after an Editors live show. You can't make music like that unless you take yourself very seriously. One of the best things about Editors has always been that they take themselves just that seriously. Let's hope they remember that next time around.